Yes, you are reading this right. Last Monday I started a month-long challenge to go without sugar. Not the strawberry kind, but the cookies, ice cream and cake kind. *shrug* Me…one who would always rather be baking…is currently on a spoonful-of-sugar hiatus. Take that, Mary Poppins. I came to this idea on my own accord after some deep thinking about ways I needed (and wanted) to change my life. My sugar dependency came immediately to mind. But I wasn’t always like this. I’d say my taste for sweets definitely snuck up on me after I turned 30, which is unfortunate since that’s when my metabolism started waving goodbye. But the addiction is real and must be stopped. I was once addicted to Diet Coke. I mean, addicted in the I-drink-at-least-six-a-day kind of variety. This was in college and in a moment of clarity (or insanity) one Christmas break, I decided to stop cold turkey. I remember that first day so well. The shaking, the headache, the anger, the crying, the frantic feeling of an addict without her supply. It was scary how out of control I felt. Needless to say, I no longer drink caffeinated soft drinks. One sip and I’m back. I can feel myself pulling toward sweets the same way I pulled toward Diet Coke. It’s been a whopping five days since I last had sugar (in the form of a PB&J sandwich….but…still), and here are a few thoughts I’ve been stewing over. I’ve noticed since working from home that when I find myself bored, or stressed, or thinking through a problem, I easily and all too quickly find myself in the kitchen looking for something sweet. I tell myself that I need its exciting burst of productivity and clarity, paying no mind to the soul-crushing low that inevitably will come an hour later. The first step in changing a habit is to recognize why it’s there and where it comes from. Hello, self awareness. Let’s go back to those highs and lows of my addiction. It’s like an energy and emotional roller coaster that I’m sure Joe is thrilled I’m stepping off. I wanted to eliminate the manic mood changes I’d have when my blood sugar would crash and I also want more long-lasting, consistent energy. Those are relationship goals that sugar will never have, so I knew I had to dump it. I should be clear that I’m not cutting carbs. That’s a deal breaker for me. But, I am cutting out a lot. I also started tracking my food–writing it down before I would eat–and you’d be surprised how much less snacking I do just because I don’t want to see it on paper. Ha! Hey, whatever works! Breakfast has truly been the hardest thing for me to tackle. I don’t really want to eat (or cook) eggs every morning, so I’ve been making steel-cut oatmeal with cinnamon and blueberries. It’s bland, but it’s working. I’m anxious to try fancier concoctions like this and this, minus the granola. These were bound to be around, especially in this first week, but I’m surprised at how minimal they’ve been. I had one stress-induced headache on day three–it was a doozy and one I would normally medicate with a jolt of sugar. Without it, I found myself grinding my teeth. #ew. Let’s not trade one bad habit for another. But, other than the familiar pang for a super sugary mocha iced coffee after my 5:30 wake-up call, I’m doing okay with everything else. Hopefully this resolve will last through the weekends, when I’m at my weakest and sugar = fun. 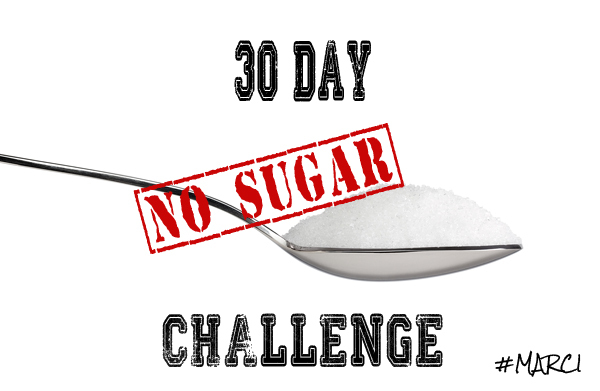 Things I want to accomplish with this challenge: I want to break my dependency on sugar for energy and feeling good. It does neither, at least not in the long run. I want to feel better in general. (Mind-blowing, I know.) I want to train new habits and find new foods that fuel me and not hurt me. 5 days down, 25 to go. Let’s do this. Huge shout-outs to my sugar-busting partners in crime, Aunt Pam and OGE-bestie Ben. Thank you for doing this challenge with me, keeping me accountable, supporting my craziness and championing my end goals. You guys are awesome! Any others out there who want to jump on our no-sugar-added band wagon? More updates as the weeks pass! Not joining the no sugar ban but discovered when I quit baking that I craved it less and less and drinking lemon-ginger tea for my indigestion really cut the desire for sugar. Think that since you have survived the first three days you are on a great cycle. Now I can even think of some foods I used to crave and go ugh! But I’m not giving up sugar free yogurt ice cream from Braums in the summer!